This entry was posted in Breads (Pani), Family Recipes, Vegetarian and tagged Baking, Bread, Food, Italian, Recipes by ChgoJohn. Bookmark the permalink. I’m thinking this is a winner! The braids look fine and give your bread baking loaf ‘character’ all of its own. IT’s unique, probably one of a kind! I absolutely love Aisago cheese, and one of my favourite spots to visit. Thank you, Yvette. This is one of the most aromatic loaves I’ve ever baked. There is absolutely no chance of mistaking it for anything other than a cheese bread — which is why I enjoy it so. If you make it, I hope you enjoy it, too. That is a seriously good looking loaf with a punch to it. Wonderful recipe which might even get me making bread. I hope you do try it, Roger. It is not at all difficult, unlike some bread recipes, and the payoff is a wonderful loaf. I’m anxious to make more loaves using a variety of cheeses and maybe a few herbs thrown into the mix. That looks amazing and your braid (or “plait” as we British gals call it!) looks perfect. How funny that the recipe did a big loop to come right back to you. I really hope I get some time to make this in the next few days as I love the sound of it. I didn´t make the connection that the family was from Le Marche. One of my dad´s sisters, Mad Zia Sara moved to lived there from Rome when she was widowed. And is living the life of a Very Merry Widow from what we hear…high jinks in Le Marche with the more mature folk! Thanks, Tanya. I was surprised to see that 1.25 cups of cheese is added to only 2.5 cups of flour. That’s a high percentage of cheese and explains why this bread is so cheesy. I hope you like it as much as I do. She would so love that…and me too! PS. Just looked at the recipe on the website and your loaf looks much nicer than theirs! If that is a complaint about your attempts at braiding a bread then humph, I’m out of here! It looks fantastic! The bread is so inviting. I don’t think I’ve ever had a bread so eggy and cheesy, and it’s only 8 am and I’m drooling John, which is not an attractive look anytime of day! One question – what size pan did you use? Serving it with soup sounds wonderful. To be honest, I’ve been snacking on it, toasted, and havent’t even buttered it yet. Cheese and pepper in a loaf of bread!!! This is soo my kind of bread. Who needs butter? Talk about twists and turns on getting back to you John! I love your braid and think it is quite clever to it with a crossover section from the centre. I usually braid down from one end. Your kitchen must have smelt heavenly while this loaf was baking. your loaf of bread looks perfect! I love KAF and go to that site a lot…In fact I have to make an order…their espresso powder in anything chocolate is a must! Thanks, Maria. Yeah, KAF is great. What I like most is the consistency of their recipes. If you do as they say, you’ll get a perfect loaf or cake or batch of cookies each and every time. I think it wonderful that you’ll be preparing the pizzagaina this year. If we don’t take an active role, our family recipes will vanish. That’s why I started this blog and look how it has turned out. A recipe that had been lost for some 80 years came back to us. Yes, your Mom will be guiding your hand, I’m sure of it, just as I’m sure that Grandma wanted me to “find’ this recipe. Buona Pasqua! An Easter gift from the universe,or heaven if you will- this Cheesy Bread recipe from your grandmother, really, finding its way to you. Your braided bread is fine looking to me, Today we will return to Rocco’s Italian Pastry shop and I am going in to see if there is a Cheese Bread, King Arthur and La Marche were just the channels used to return this recipe to you and your family where it belongs. Looks delicious.. Thanks, Ruth. I hope you do find some. I started this blog to document the family’s recipes and now it seems to be doing its part to bring more to light. Zia was thrilled to hear about this recipe. It’s nice how things worked out. You are very kind, Spree, but I’ll stick to making pasta. Grandma made a round loaf and if that was good enough for her, it’s certainly good enough for me! If you do make a loaf, I hope you enjoy it as much as I do. The bread is gorgeous! I think you did a fine job on braiding. I could smell the bread baking in the oven and all of the cheesy smells while you were explaining it. Wonderful! Why should this game be any different? I’m having a ball reading the worldwide response to this post, by the way. So cool! How true about our fellow residents of Sec 525!!! And isn’t this cool? It is a genuine community populated by some of the nicest people. I lucked out, to be sure. wow, that looks so frickin’ GOOD!! Thanks, Chris. It is a great loaf of bread. Funny you mention that you’ve tried to make it, Celi. Zia mentioned that, over the years, she tred to recreate Grandma’s bread but, without a recipe, she never got the hang of it and forgot all about it. Now that I know the “traditional” recipe, I can’t wait to experiment with other cheeses and some herbs. I’m sure you’re going t love this bread and it isn’t at all hard to make. I simply love how food connects us in so many ways and the internet makes it that much easier. I too have been surprised by some of the recipes at KAF and I have been a big fan of their flours for years. They do a good job of paying attention to reader comments and accept recipes submitted by readers…I wonder if that’s how this recipe made its way there? The idea of cheesy bread got me to thinking how good it would taste as a toasted sandwich with some smoked turkey–oh yeah, that would be delish! Well done, John. Thank you, Judy, and we are in agreement about KAF. I’ve never had a bad result with one of their recipes. To be honest, that loaf of bread went so fast that I didn’t have a chance to even consider making a sandwich. I didn’t even butter it after toasting. I do want to experiment with the shape of the loaf. If it makes a good baguette, I bet some wonderful bruschette would be possible. Fingers crossed! As a bread person, Courtney, you’ll love this bread. The recipe isn’t at all involved and there’s simply nothing like the aroma of this bread baking in your oven. It is unbelievable! Like the other commenters before me, I took one look at that lovely loaf and said “wow” out loud! I think your bread…and the braid…is gorgeous, and the cheese to flour ratio sounds perfect to me. Cheesy bread, right up my alley. 🙂 I’ve had fear of bread making, but this one looks too good to not try it! What an interesting path…it really was a meant to be recipe for you! Thanks, Barb, for the compliments. I hope, by now, the storm was nothing more than a threat and you’ve no more snow on the ground than you had when you woke up this morning. I, also, hope you’re baking a loaf of this bread. Your kitchen will be filled with the aroma of cheese bread baking. I loved it! It is funny how this recipe found its way back to us. I’d never heard Mom nor Zia mention this bread. I no sooner mentioned the name than ZIa started talking about Grandma baking this for them. I was so surprised, as was she. She’s off to visit her son and DIL for Easter. I hope they’ll bake it but, if not, she and I will bake a loaf when I visit her next time. She’s going to love it! I hope you will, too. Lots and lots of snow and a white out.. I’ll venture out for the ingredients tomorrow… if there aren’t drifts by then:( This loaf in my oven would be wonderful right about now!! How do you do, Mariano? This is such a pleasure! My Mother’s parents came from Corinaldo, my Father’s parents from San Marino. Mom’s sister, Zia, married a man whose family came from Fabriano. It has been about 80 years since this bread was made for us. Zia was very happy that I found it through your website. When I visit her next time, I’m going to show her your webpages. I am sure she will be very interested. I enjoy your blog and read all of the posts. One day I hope to get back to Italy and, this time, I’m going to visit Le Marche! Thank you for creating such a great blog about Le Marche and for bringing Crescia al Formaggio back to my family! Buona Pasqua! I am so proud to be followed by you and your family, now I know exactly what I am doing with my “curation”. A movie about Le Marche would be interesting and filming people when they return is a wonderful idea! ! I hope he is successful and his movie becomes a reality. I noticed that you’ve highlighted our Trippa recipe. Thank you for that and for the work you do promoting Le Marche. As soon as I saw your post title, I thought – John beat me to it!! I so wanted to post an Easter bread recipe this year but with all that is going on in my life, I just couldn’t get around to it! My mother also did not bake Easter Bread (just the cookies with the eggs) but I began making one years back. It didn’t have the cheese in it; this looks very different, but did have the eggs tucked into the braiding. Which, btw, is very nicely done. You’re just too hard on yourself, John!! I always thought KAF recipes required using their flour and if you didn’t the texture would be different? Your cut slice looks gorgeous. Perfectly done. I do wish you a very happy Easter John. I thought that someone would have posted this once I eventually found it on KAF. No matter, though, because I was still going to post it for my family to have access to it. This recipe was “lost” for about 80 years and I want to make sure that it’s written down. Besides, Zia was thrilled when I told her about this “new” recipe I found. I’ve seen “your” bread with the eggs in it, although Mom never baked it. Like your Mother, Mom dealt in cookies primarily. I always thought your bread looked so festive! I hope you do eventually post the recipe — although there’s no rush. Your plate is pretty full as it is. Thanks for your (always) kind comments, Linda, and I hope you and yours have a wonderful Easter! oh one other thing…have you ever made the “basket cheese”? you know the farmers cheese…I need a recipe, cause I am not paying what I paid this year for it…Wow it was a lot of money!!! Although I do not make it — yet! — one of the websites I use as a source has a recipe. It’s really very easy and you should have no problems. 2 things to consider: the recipe calls for 1 teaspoon of rennet. Most sources will equate one teaspoon of rennet to 1 Junket tablet. The recipe also directs you to use cheese molds. I make my own from empty tin cans. You’ll need at least one large can, either a large tuna fish can or canned tomatoes. Remove both ends but save one. This will work just as good as any mold & save your money. Never having made it, I do not know how much cheese you’ll get from this recipe. One large can may not be enough. Had I not seen your pictures of braiding the raw dough, I would never have suspected a “bad braid”, John. Furthermore, I think your bread looks lovelier than the King Arthur Flour version! I love how light and airy the bread turned out. Dare I say it’s time to get a panettone nor brioche pan? I think I found my bread recipe for Easter dinner with my family next weekend! Thanks John. Your blog has inspired many a posts for me, thank you! That’s a kind thing to say, Eva. I’m both honored and very grateful. I made the bread yesterday, John and I dare say it is one of the BEST breads I have ever made. I halved the recipe and wish I had doubled it instead. I took it to a friends house for dinner. We just tore it apart from the little braids and had it with a lovely selection of cheese! I was surprised at how light and airy it turned out, considering the lack of expansion during the 2 hours of proofing yet the last 2 hours it doubled in size and filled my little loaf pan perfectly. I did a combo of Pecorino 2/3 and Parmesan 1/3 which worked out wonderfully. I’m making another one for dinner next week, thank you! PS, I just braided mine in the traditional braiding method (like braiding hair) and it was gorgeous! I think the loaf is perfect! While none was left over, I bet it would make a kick’n savory french toast! Oh my! That is beautiful bread! I am so crazy about this post….the bread, the story behind it, love! I can almost smell it baking. Wonderful! I love this kind of baking, and I haven’t made bread in forever. I will definitely give this a try. Thank you! Too bad, Kay, that WordPress isn’t scratch & sniff-capable. The aroma of this bread would convert you to being a bread person. You say that it looks decadent. I say the aroma is intoxicating. That’s some loaf of bread, eh? Thank you for commenting and have a great day. Thanks, Debra! This bread is made for bread lovers, no doubt about it. KAF suggests using a brioche pan if a panettone pan is unavailable. When you go to that website, you’ll see a more traditionally formed loaf. John, I think your braided bread is beautiful and I am sure it is delicious. I was thinking how beautiful it was when I got to the second photograph (before I reached your disparaging comments). 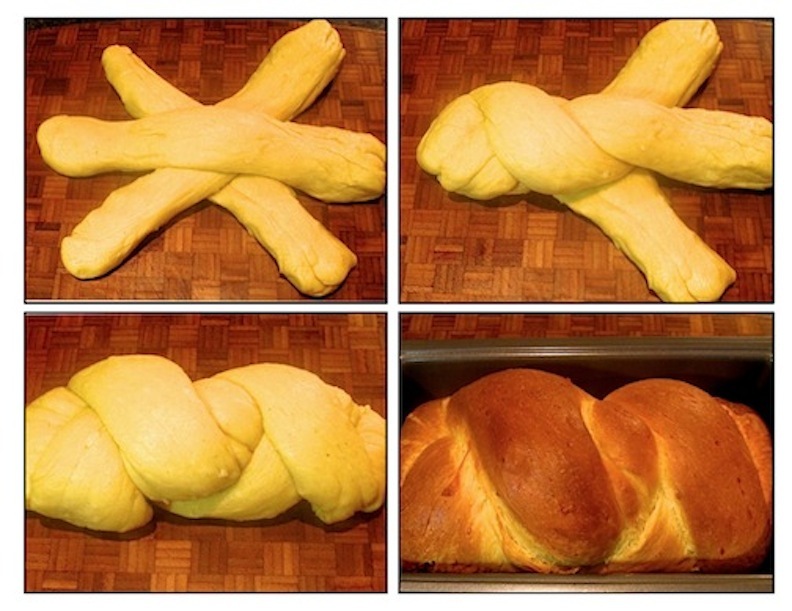 We are always our worst critics.When I first saw the braided loaf, I gasped (with delight!) and thought, “I could never make my bread look that beautiful!” and then I read your critique and couldn’t believe what I was reading. It’s a gorgeous loaf that I would think to find on the shelf at some artisanal bakery. I am so happy for your family that you have found this recipe and you are “reunited”. The Asiago and Pecorino combination sounds to die for. Have a wonderful Easter John. You are very kind, Geni, thank you. I really lucked out with this bread. It hits every note I’d hoped it would. And you’re right. The Pecorino and Asiago were the perfect match. Here’s wishing you and your family a happy Easter, Geni. That is a beautiful loaf of bread…you are too critical I think. I was really surprised when Zia recalled her Mother baking this bread some 80 years ago! I’m just glad it’s back in the family, braids or no. When you decide to give bread baking a try, Caroline, and we both know you will, this should be one of the first on your list. You’ll love it! A saint would not have been able to resist cutting into that masterpiece! I think your recipes should be world famous so this makes sense to me. This might not be from the Bartolini clan, but it still looks wonderful. Thanks, Greg. That’s kind of you to say. When Katherine posted the bread casserole last night, I wondered if this bread could be used. Granted, the bread’s cheese ingredients may need to be changed a bit but I think having a cheese-flavored bread as the casserole’s base would be great. A slice of that cheese bread fresh from the oven with just a thin spread of butter ………. heavenly! What’s wrong with your braiding? Looks like a loaf of bread with “big bucks” price tag. Yummy! That sounds sooo good. I fully understand using Swiss (given the times), but I’ll take the Pecorino and Asiago any day of the week. 😉 Great bread my friend! Thanks, Jed. When I next visit Zia, my Aunt, I’m going to make this bread for her and the first loaf will be with Swiss, a tribute to Grandma. The next one, though, will be with Pecorino & Asiago. They make a great combo! You should give this bread a try. It doesn’t get any better than asiago and bread, well until you toss in the pecorino. Delicious combo John. And I love KAF. We stopped in their bakery this past summer. Talk about a feast for the eyes and mouth! Also thank you for posting the pictures of how to shape the bread. That is always where I’m most challenged. I hope you didn’t have any problems following the recipe and that you all enjoy the bread. Wishing you and your family a wonderful Easter, Lisa! There’s no time to add it to our Easter table, but I suspect it will make an appearance at dinner before too long! Well, next time I’m shaping it like Grandma did, a round loaf! If you do make it Marie, I hope you like it as much as I do. In the meantime, have a wonderful Easter and may the Easter Bunny be extra generous to your Li’l Angel & Niko. Wow! To think of all the twists and turns you went through to get this amazing bread and then to find the recipe in the span folder! Well, there’s noting sweet about this loaf of bread, Christina. With so much cheese, it is very savory and, for me, very enjoyable. You should give it a try. Bet you’ll like it! This bread looks delicious – wherever the recipe came from! Agreed. The bottom line is that I’ve got the recipe and the bread is good. I first ran across a recipe for a similar cheese bread in my Betty Crocker’s International Cookbook, the French cheese bread called Natte which uses Swiss or Gruyere cheese. I’ve never made it but I’ll have to give them a comparison for ingredients and technique. Both the braid and traditional star pan presentations look stunning. It was a surprise for me to learn my Grandmother made a close version of this bread some 80 years ago. She used bits of Swiss cheese in hers, along with the Romano. If you’ve not made Natte before, I suggest you go for it. If it is anything like this bread, you’re going to really like it. Thanks for stopping by and taking the time to comment. And, my nephew is coming back to town this weekend for the next 4 weeks and mentioned pretzels. Do I ever know what you mean! Some weeks ago I made cream cheese and bagels. Although both were good, just how much can 1 person eat? I tend to give away plenty of food and don’t prepare many of the dessert recipes unless I’m having people over for dinner. I hope you enjoy this bread. Please comeback to let me know. Thanks & enjoy your nephew’s visit. Great looking bread! The King Arthur site is quite good, and always a source of ideas. Even though I don’t always agree with their recipes, every one I’ve tried works – it’s just that I want to do things differently! Anyway, this bread is definitely worth trying, and I loved the story. Thank you. John, your Easter bread is gorgeous.I am not a bread baker. I wish I was. And reading about the aroma I can imagine how wonderful it smelled. I am dreaming of cod, homemade pasta, and a warm slice of Easter bread!! Thank you so much, Judy, for leaving such a nice comment. I am sure that you could make this loaf of bread. The King Arthur recipes always work if you follow their directions. And considering those marvelous cupcake creations you make all of the time, this bread would be a snap! That you don’t have a cupcake bakery is a shame! You are one talented baker. Thank you John! You are wonderful! If I did own a bakery I would invite young adults/children who don’t have the luxury of experiencing cafe & bakery style desserts. I would never make a living, lol. I enjoy giving the cupcakes away and making others smile. That is my payment. Thank you again for always being very kind! I think your braid looks lovely with those plump golden curves just begging to be pinched off and gobbled. This is one of those times I wish the interwebs had smell-o-vision! PS: I love KAF, their recipes are delicious and so well thought out. I just posted an Easter bread recipe today John and came to have a peep at yours at the recommendation of Barb Profiterole. YUM. Love the idea of adding cheese. I also love your braiding, as it gives the bread an unmistakable home-made touch! I think this bread is pretty forgiving anyway – once it puffs up to its’ golden aromatic goodness, the plaiting goes unnoticed. Will definitely give this one a try as my boys are now in love with Easter bread. I have a suggestion… place your dough on a cookie sheet or like the “old days” a cast iron fry pan… I have been using an air bake cookie sheet the last few years, less chance of burning… but for years my mom used four in the bottom of the cast iron… just mound the dough and using egg yokes give it a wash and bake. My mom made “a doll for the girls and a horse for the boys” Kind of looked like a ginger bread girl then the egg on the stomach with dough rolled in an X to hold on the egg…. really just for decoration. she would put on a few sprinkles and raisins for eyes…. lots of memories. 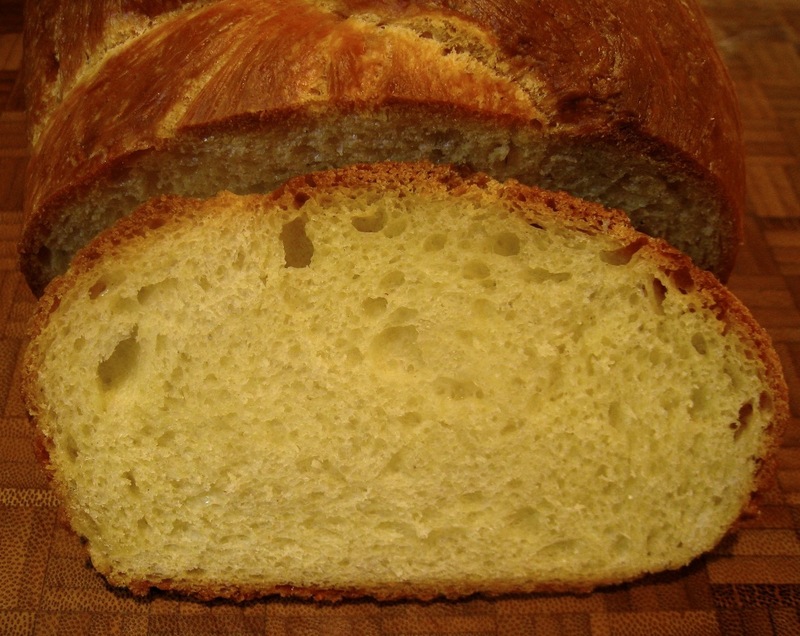 My gmother came to the US in 1903 and the forth generation has just taken over the baking… I have been looking for this Easter Bread recipe with Romano and fresh cheese (basket cheese). My relatives were from Sulmona, Abruzzo….love to hear from anyone who has the recipe. That’s a great suggestion, especially for one like myself who is braiding-challenged. When I spoke with Zia about this, she mentioned that Grandma used Pecorino Romano and small chunks of whatever cheese she had available. She remembered one with Swiss specifically. I bet fresh cheese would be fantastic in this bread. As it is, I love the flavor and aroma that the Romano cheese gives the bread. Thank you for visiting and taking the time to leave your suggestion. I’ll have to give it a try this year. This is gorgeous. 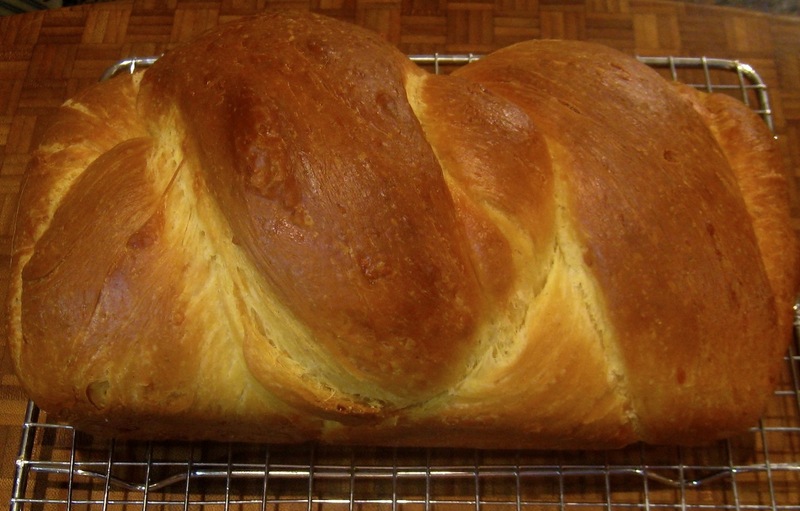 It looks like challah, but better. Why have I never added cheese – flavorful, Italian cheese – to my braided loaves. What a tasty tidbit of bread goodness! I saw Mariano’s post about this bread and decided to try it for Easter- my mother in law’s family is from Le Marche. Now that I see your version braided, that’s how I will do mine. I think your loaf looks just great! Hello, Lani. I hope you do try and enjoy this much as we all do. It’s great and the hint of pepper is, for me, fantastic! Hello!! We have had this bread in our family, as my grandfather was from Le Marche. NO ITALIAN I have ever met outside my family has heard of this bread! This was not a problem until today. My mother unfortunately recently passed away and I have taken over the Easter baking duties–but we cannot find the recipe among her things! So, I resorted to Googling “Cheese bread from Le Marche”–and brought me to your site! Am so happy to have found this and now want to sit with your blog rather than bake!! Of note, the family never braided this bread. It was baked in an enamel roasting pan; recently my mom took to baking it in a Turk’s head; she thought it baked more evenly that way.Happy Easter to all!! Welcome, Deb. Sorry to learn of your Mom’s passing. I’m sure your family misses her very much. Since writing this post, I’ve made this loaf several times and only braid it if I’m having guests. For myself, I’ll form the dough in a circle or oblong shape and place it on a baking sheet for the 2nd rise. A Turk’s head sounds like a great way to do it. I hope this recipe lives up to your expectations. It’s been very well-received whenever I’ve served it. Thank you for taking the time to visit and leave a comment.